What’s your favorite thing about Thanksgiving? Is it the food? The chance to catch up with your friends and family? Or is it the football and fall fun that get you excited for this special day? 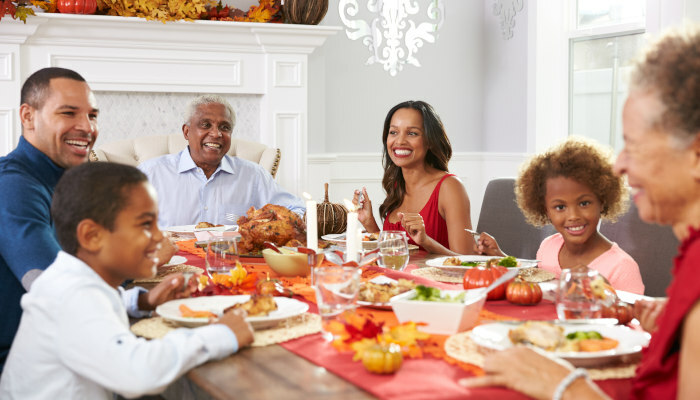 There are a lot of things to love about Thanksgiving – and, if you have elderly family members coming over to celebrate this year, it’s important to make sure that this festive day is just as enjoyable for them. Remember that this is a day for the whole family. It’s important to keep your senior loved ones’ wants and needs in mind. As we get older, our appetites tend to change. Plus, medication side effects, oral health changes, and many other factors can influence how much your older loved one may eat, and what kinds of foods they prefer. Before the big day, be sure to talk with your elderly loved ones about their dietary needs and preferences. You may wish to tailor many aspects of the main menu for their palette, or make sure that there are at least a few “senior-friendly” menu items ready to go. Will your aging loved ones be able to move around safely in your home? Are there any steps you can take to ensure that they stay comfortable, during the whole day’s festivities? At the same time, be sure to check in with your older loved one, as well as their medical professionals and primary caregivers. Make sure that they have their medications packed and ready to go for the holiday, pack extra clothes and blankets, and generally think ahead – what might your loved one need while they travel? What could help them settle into a new environment for a day or two? If your loved one regularly has a companion who assists them with activities of daily living, such as performing chores, walking, grooming, or sitting and standing, it may benefit your senior – and the whole family – if that caregiver attends the family Thanksgiving. If you believe that your elderly loved one may benefit from the assistance of having a professional companion during the holiday season, don’t hesitate to drop Companions for Seniors a line. Our professional caregivers can help provide your aging loved one with the support they need, giving you back time to focus on making sure that every other part of the Thanksgiving plan goes smoothly. Have any more questions about what you can do to support your loved ones during the holiday season? Want to talk about getting started with companionship and caregiving for your senior family members? Don’t hesitate to get in touch with Companions for Seniors today. Locally owned and operated in the Chicago area, Companions for Seniors helps provide seniors with a higher quality of life, while also offering respite and peace of mind for a family caregiver who might need some support. Our companions help stimulate our clients physically, mentally, emotionally, and spiritually, empowering them to live an active and enriched lifestyle.